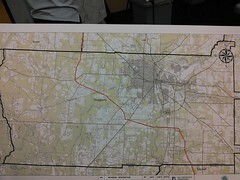 Valdosta, 16 March 2014 — Florida forms the field for the pipeline fight this week, at a Suwannee County Commissioners meeting and three FERC Scoping Meetings. Plus later a SpectraBusters panel on the issues. This is FERC’s Letter order approving Sabal Trail Transmission, LLC’s 10/4/13 Pre-Filing Request re the planned Sabal Trail Project under PF14-1. See also FERC refuses to release RFP for environmental contractor. 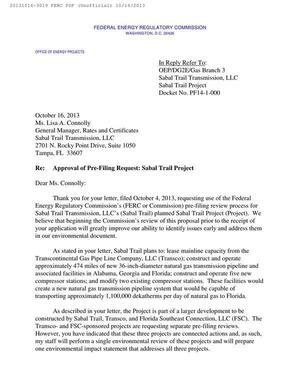 Thank you for your letter, filed October 4, 2013, requesting use of the Federal Energy Regulatory Commission’s (FERC or Commission) pre-filing review process for Sabal Trail Transmission, LLC’s (Sabal Trail) planned Sabal Trail Project (Project). We believe that beginning the Commission’s review of this proposal prior to the receipt of your application will greatly improve our ability to identify issues early and address them in our environmental document. 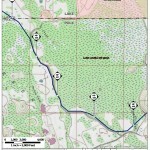 We, the undersigned, are landowners who have received several letters from Sabal Trail Transmission Pipeline LLC’s agents and attorneys informing us of Sabal’s intent to enter our respective properties to conduct surveys in connection with the FERC Docket No. PF14-1. Originally, some of us had given consent to the company to conduct the surveys. However, based on recent events including the company’s refusal to provide us with details about its proposal and its efforts to harass us with visits, letters and phone calls about the survey, we hereby RESCIND our original permission. A Sumter County, Florida resident copied her U.S. Senators when she asked FERC to answer the questions Spectra won’t. Senator Bill Nelson directed FERC to answer.